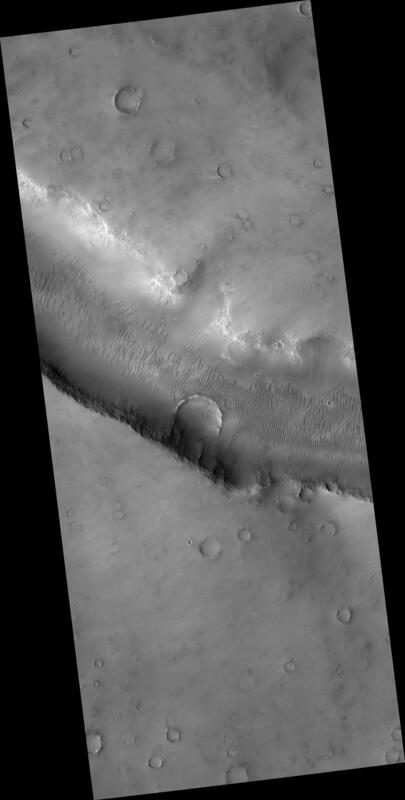 This HiRISE image ( PSP_003273_1675 ) shows part of Evros Vallis, one of the Martian valley networks. These more ancient valley networks may have been eroded by flowing water during a warmer, wetter period of Martian history. Many dunes are visibile along the valley floor, as well as throughout the scene and in a partially exhumed crater on the valley wall. 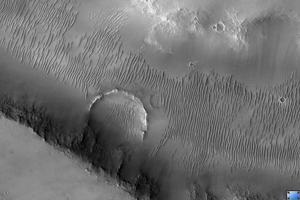 There are multiple generations and orientations of dunes. Dune orientation reflects the dominant or prevailing wind direction. Multiple dune orientations indicate that this region has experienced different wind regimes. An exhumed crater is one that likely formed a long time ago, was buried, and is now being re-exposed because the materials that originally covered it are being eroded away. The prominent crater on the valley wall as well as several other craters in this scene are thought to be partially exhumed. The subimage (approximately 300 m across) shows a couple groups of secondary craters. Secondary craters are craters that form when ejecta from the primary crater hits the surface with enough energy to form another smaller crater. As seen in the subimage, secondary craters often form in clusters spatially, because ejecta thrown out of the primary crater impacts the surface near each other at approximately the same time. Many potential secondary craters have have similar morphologies and have distinct, bright ejecta. This implies that these craters are relatively young and that their ejecta have yet to be covered by dust.